SINGAPORE – A three-judge panel meted out reduced jail sentences for six City Harvest Church (CHC) leaders on convictions of criminal breach of trust and falsification of accounts on Friday morning (April 7). Church founder Kong Hee will have to spend 3½ years behind bars, in the high-profile case involving the misuse of millions in church money to fund the pop music career of his wife. He had originally been handed an eight-year jail term in November 2015. His wife, Ms Ho Yeow Sun, whose racy music videos and lavish lifestyle had attracted controversy, did not come to court with him on Friday. Kong, 52, together with five other church leaders, were found guilty in 2015 of varying charges of criminal breach of trust and falsification of accounts, after a marathon 142-day trial that started in 2013. The other five are deputy senior pastor Tan Ye Peng, 44; former CHC finance managers Serina Wee, 40, and Sharon Tan, 41; former CHC finance committee member John Lam, 49; and former CHC fund manager Chew Eng Han, 56. Like Kong, all five had their jail terms reduced after the court, in a split decision, allowed their appeals against conviction and found them guilty of a less serious charge of criminal breach of trust. Tan Ye Peng originally got 5½ years’ jail. He now has to serve three years and two months. Chew originally got six years. He now has to serve three years and four months. Wee originally got five years. She now has to serve 2½ years. Lam originally received three years. He now has to serve 1½ years. Sharon Tan originally received 21 months. She now has to serve seven months. All six have requested for deferment before they start their jail terms. 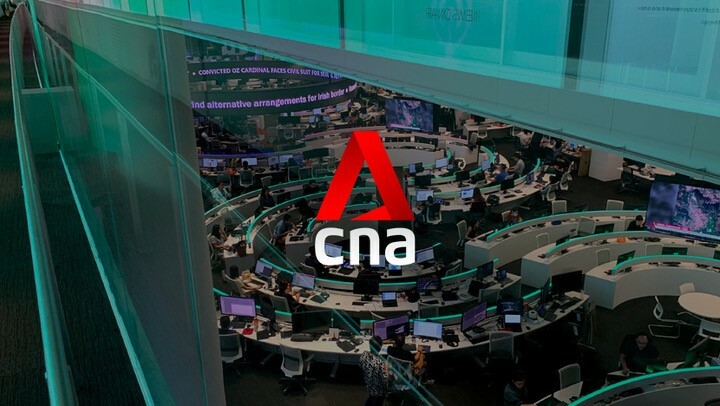 They had channelled $24 million from CHC’s building fund into sham bonds in music production company Xtron and glass-maker Firna. The money was in fact used to fund the Crossover Project, a church mission to evangelise through the music of Ms Ho. Later, another $26 million was used to cover up the sham bond investments. Delivering their ruling, the judges said it is a situation which involved no personal gain on the appellants’ part. They believed that their acts, especially in sham investments, would advance the interest of the church. They accepted that the Crossover project was genuinely endorsed by the church, “even if it was not 100 per cent”. “None of the appellants could be said to have benefited, and their fault lies in adopting the wrong means,” said the judges. Kong, fingered as the key man behind the scandal, got the heaviest sentence. The judges agreed that his overall culpability is the greatest and he provided the overall direction and moral assurance. He also instilled the confidence in the Crossover Project and his wife Sun Ho’s success in the US. He was one of the main players if not the main player who set the direction in the sham charges, said the judges. His role as the spiritual leader and the breach of trust should be reflected in his sentence, they added. His lawyer Edwin Tong told reporters: “He (Kong) has told me that he is disappointed with the outcome in terms of the conviction not being overturned.” But he appreciates that the judges said they were acting in the interest of the church, he added. In November 2015, the six were handed jail terms ranging from 21 months to eight years in what prosecutors called the largest case of misuse of charitable funds in Singapore history. The prosecution appealed for longer jail terms. The six also appealed, asking for their convictions to be overturned and for shorter jail terms. The appeals were heard over five days in September last year. On Friday, the court – Judge of Appeal Chao Hick Tin, and Justices Woo Bih Li and Chan Seng Onn – delivered their verdict in a packed courtroom. Members of the public started queuing up to get a seat in the courtroom as early as 1am. 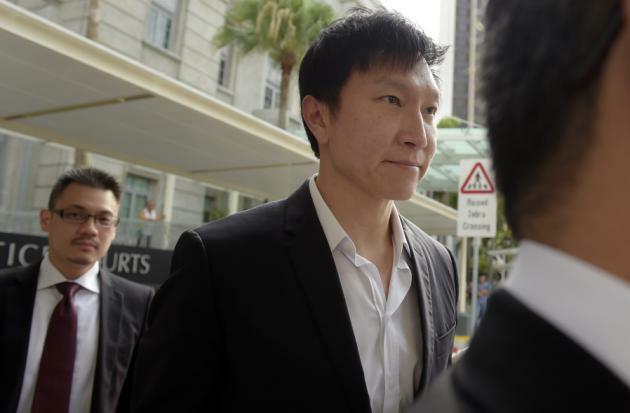 SINGAPORE: City Harvest Church founder and senior pastor Kong Hee has had his prison sentence reduced to three years and six months from eight years, while the other five leaders also had their sentences reduced. The six were in court on Friday (Apr 7) to hear the outcome of their appeal against both their conviction and sentences after being found guilty in October 2015 of misappropriating about S$50 million of church funds. Former fund manager Chew Eng Han had his six-year sentence lowered to three years and fourth months, while deputy pastor Tan Ye Peng had his original five-and-a-half-year sentence cut to three years and two months. Former finance manager Serina Wee Gek Yin’s original five-year sentence was halved to two years and six months, and former finance committee member John Lam Leng Hung’s three-year sentence was similarly halved to one year and six months. Former finance manager Sharon Tan Shao Yuen had her 21-month jail sentence lowered to seven months. Friday’s hearing was the culmination of a five-day appeal heard in September last year by a three-judge panel, including Judge of Appeal Chao Hick Tin and Justices Woo Bih Li and Chan Seng Onn. After the revised sentences were announced, Kong, Lam, Chew, Tan and Wee all asked for their sentences to commence after two weeks, and the court agreed. Sharon Tan had asked to defer the start of her sentence by two months, as her family is relocating overseas in June and she wants to help her children adjust to the move. The court agreed to this, too. The City Harvest case is unprecedented. The S$50 million taken from the mega-church’s coffers is the largest amount of charity funds ever misappropriated in Singapore. The money was used to bankroll the secular music career of the pastor’s wife Sun Ho, without the knowledge of the congregation which is made up of tens of thousands of worshippers who had donated the millions of dollars to the church. The case is unprecedented also because the millions were “replaced” through a series of sham investments and shady transactions, and the church ultimately suffered no financial loss. “If this is the largest amount going out the door, it is also unprecedented in that it is the largest amount coming back,” Kong’s lawyer Jason Chan had said. Still, the actions of Kong and the five co-accused were criminal – they effectively took City Harvest Church’s funds into their own hands to use as they pleased, despite them being plainly not authorised to do so, a judge had said. Although the congregation largely supported Sun Ho’s secular music career – through the church’s Crossover Project which aimed to use her music to evangelise – they had no idea that they were footing the bill. A total of S$24 million of church funds diverted into sham investments was used to bankroll Ms Ho’s budding career and extravagant lifestyle. Another S$26 million of church funds was used to cover up the first amount to fool auditors and to conceal the fact that money from the church’s building fund – a restricted fund set aside for building-related expenses – had been used for an unauthorised purpose. I got Certified in MCSA Server 2012 by passing three exams. Today I done my third last exam and finally passed. This third exam I failed twice and this timeI study the same 3 times compare to one time in last time retake this same exam. First exam in July this year failed. So I retake in start Sep this year and passed. Second exam passed the first time. I brought the Microsoft booster pack for 3 exam with 4 retakes and practical test each of them included for USD$225 each so is total USD$675 which is about over S$940. Next year Jan may seek my company for approval to take another year of contract training grant up to 1k per year to go for part time night course in CCNA routing and switching, then once completed use my pocket money to go exam. I completed the course MCSA Server 2012 in 3 months ended 1 July 2016 part time night course and assessment done with homework in school last week Friday in school in order to claim the government grant for subsided course fee. renewal for a year job contract and pay raise. The letter from HR come in quite late. My previous job contract ended 05 Aug 2016, but I only receive letter in 12 Aug 2016 Fri evening which dated 05 Aug 2016. There is a pay increment of over 3% plus and extend for another year contract with a completion a month bonus of previous contract credit in next month pay roll. I had been working for 2 years 5 months which my pay increased three times as 5 months job contracted completed also increase pay. So on average quite close to 5% increment. This is due to bad economic growth this year which my boss told me he is a perm staff this year no increment except mine is on contract under client costing. 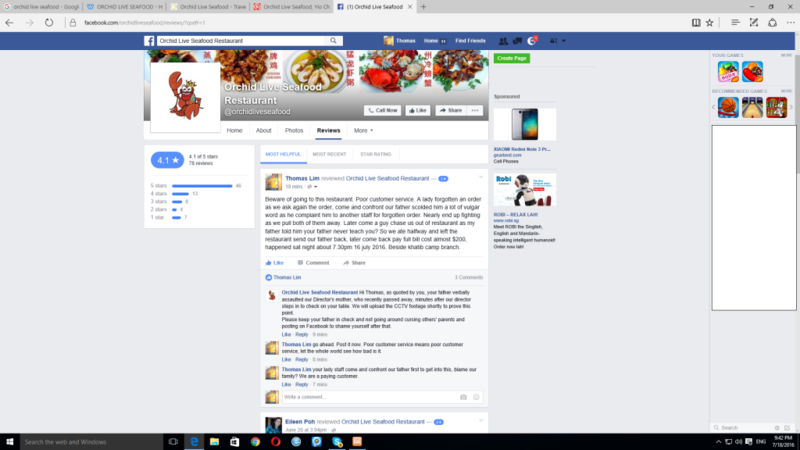 Interesting Post as my whole family eating in Orchid Life Seafood Restaurant. Interesting post to read, a seafood restaurant said the director had no problem, it’s my father fault insulted his director mother who passed away which we did not know. I screen shot in case they deleted treated it nothing happen. I decided not to serve In church ministry. So I went to open house as previous post I call the church to ask for more enquires. The timings are rather long. At start I will be put under probation 3 to 6 months to join choir ministry which have to come every Saturday for practice and rehearsal from 1.30pm to 5pm plus. If I show some improvement I will be out of probation to serve in 7pm Saturday miracle service. Then I will be on roster for fortnightly like Saturday 1.30pm to 5 plus, then dinner then 7pm Saturday miracle service plus next day Sunday continuous for 9pm and 11.15pm services. I ask What about the services in Sunday afternoon 3.15pm no choir but support singers. She said that the support singers will not be train by her in the choir but under a pastor normally selected from choir if they serve long enough and good. So I do not have too much time I decided to call off the audition not to join church choir to serve in ministry. My vocal teacher knows about this later on and said the timing is also too much for this church. Should I serve in church ministry? I had just attended last Saturday church ministry open house which is lighthouse evangelism at woodlands Singapore. Before that one week ago last Sunday 22 May 2016 I heard about the announcement of church open house ministry called WOW stands for worship, operations, works of arts as previously was known as music and drama department, so I approach the counter after the service. So a church staff who she is in charge of choir told me that just sign up for the ministry even I told her that I would want to know the schedule as I am very busy and sure crash many time cannot serve at all. She said that the schedule can be arranged. So I sign up hand written on the paper by leaving my name and contact which ministry I want to serve which is both choir and musical instrument. As the handwriting is not very clear, I went to church web site online to register as choir as only can select one then put in musical instrument played is piano. One day later the church called me up at night after my Monday night class that I sign up for choir need audition so can come for open house first. As I attended open house, I seen all the ministry which they explain what they do, but they do not tell me exactly what is their schedule to serve clearly enough. As I have piano lessons weekly Sunday 1pm and Saturday 4pm vocal lessons, I could not have time to serve, especially in weekend I sleep in the morning wake up almost noon or even later Saturday and Sunday as weekday work the whole day. Unless I can give up my music lessons even both of them to serve in church ministry as you cannot excepted me to cancel music lessons often that both private lessons are quite flexible compare to music school. After the open house, the ministry head will contact me next week which is this week for follow up, maybe I would ask the schedule before arrange for audition. I think is very unlikely for me just go for audition to be accepted first or reject as my schedule most likely will not work out. I cannot except ministry head to contact me telling me to go audition first later a few days if contacted to be accepted then talk later about the schedule to fit mine right? About Letter to Lighthouse Evangelism for Saturday Miracle Service on God Healing. I had been thinking about should I post it in my blog for quite a few weeks about this issue after I send out a letter to this church. But seems they have video streaming online on their Saturday miracle service so I had been watching a bit for a few weeks, some testimony shared on stage. Since I believe given sufficient time like a few weeks for them to do a bit of adjustment but they did not try to correct it, then I would post it here. I believe miracle service have many ideas and way of sharing it rather than this way. This letter is writing about your church bulletin today Healing of Hyperthyroid and High Blood Pressure for next week Saturday miracle services to be preach. It had been a concern to me for many years for these kind of healing testimony similarly being talk about in many churches. Of course almost all medical treatment will have different side effect whether is light or heavy that you have to overcome it to lead a happy active life. If God promise that you get healing easily simply attending miracle service and go back pray mediate on God words, then I would like to say it is a cheap grace if shared out on the stage it is not very edify. And if this kind of testimony used on others that medical treatment does not help much reduce it or no need to have it anymore, it will cause much serious problem not able to enjoy happy active life. I recommend such kind of testimony can keep it to yourself no need to share in stage. But I have no right to control if this continue on. On previous letter dated 22 Dec 2012 request to resign from your church membership to Pastor Colin which church had send reply that my membership was removed from church roll, till now it had been a right decision which I think. I put an excuse that I attend New creation church is I worried the church think I left church and nowhere to go church, I will turn cold to God and church will be sadden. Right now I do not have a home church to go for a very long time and not going to find a home church now as not needed. I was water baptize in City Harvest Church for a purpose of making it as my home church but after that I had many problem and left the church. I hope the church will have a better testimony to share like battling illness to be recovered or getting a little better even to enjoy happy active life like God had given you a doctor which is Jesus and medical treatment which is Holy Spirit. In this case SATAN will say Good and left you which is winning the battle with devil. Testimony like Reducing to avoid doctor and medical treatment are cheap meaning become loser and if really God give you a miracle not too good to ask people follow God in this way. And if really God works in miracle in such a cheap way then can ask Government no need to invest in medishield life give us money better as most of the different faith God will heal miracle no need medical treatment. Another reason why I resign church membership after one year is I not serving in any ministry even regularly attending cell group at that time. Plus I do not practice tithing so serve no purpose to keep the membership. I treat it as visitor to go church right now. I do not follow your church teaching too well. At start I going church to learn about Jesus and Holy Spirit. Once I have both with God I can be on my own no need to attend church regularly as normally people like me suffering from Schizophrenia a chronic illness long time ago till now does not get along with any brother and sister well for long. Like going learn driving passed got license as got Jesus and buy a car as got Holy Spirit but need to obey traffic rule in order to drive. A week after six City Harvest Church (CHC) leaders convicted for fraud were sentenced to prison, the prosecution filed an appeal on Friday, saying the sentences ranging from 21 months to eight years were “manifestly inadequate”. In a media statement issued by the Attorney-General’s Chambers, the prosecution said it was appealing against the sentences imposed on all the six accused. On Friday last week, Judge See Kee Oon sentenced CHC co-founder Kong Hee to eight years in jail, the longest of the sentences handed down. Former finance manager Sharon Tan got the lightest sentence of 21 months in jail. Ex-finance committee member John Lam was sentenced to three years in jail, former finance manager Serina Wee to five years, deputy pastor Tan Ye Peng to five years and six months, and former CHC fund manager Chew to six years. All of the six individuals were convicted last month of criminal breach of trust involving S$24 million and using S$26.6 million to cover it up in a bid to boost the pop music career of Kong’s wife, Sun Ho, in the US. In a Facebook post later that day of his sentencing, Kong said he was “saddened” by the length of the sentence. “I am presently studying the judgement and sentence carefully with my lawyers, and will make a meaningful decision whether to appeal in due course,” he said. Former Mandopop star Ho Yeow Sun, 43, is now officially a pastor at City Harvest Church. 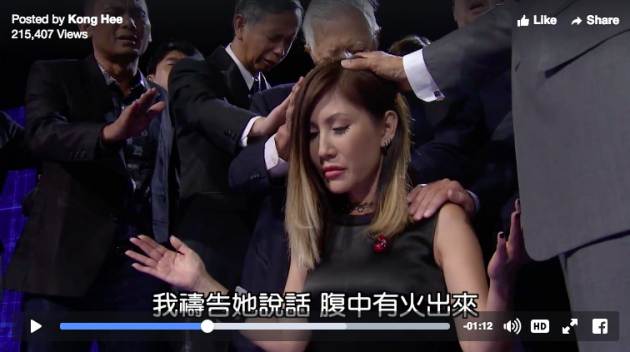 Her 51-year-old husband Kong Hee, who is also the founder of City Harvest Church, posted a video of her ordination on 19 October, two days before he, along with five others connected to the church were guilty of criminal breach of trust. The two-minute clip shows Ho being ordained by someone who appears to be Dr Michael Scales from New York’s Christian College (NYACK), as well as her husband Kong, who was one of the six church leaders declared guilty for misappropriating church funds to finance Ho’s singing career. During the ordination, Ho was seen kneeling on the stage, in front of thousands of congregants, with several others standing behind her. Kong held her head while praying, before handing her his Bible. “I pray when she speaks, fire will come out of her belly,” he said. As a pastor, Ho will be responsible for leading City Harvest Church, and providing counsel and advice to its congregants. Kong, who is also the founder of the mega church, was suspended from his duties at the church after he was charged for three counts of criminal breach of trust. He is currently waiting the prosecution’s written submissions to court, which will take place on 6 Nov. His lawyer will respond with a mitigation plea on 20 November. Sentencing is expected to take place either on the same day or at a later date.